Callum Morris is congratulated after his second-half goal. Ross County progressed to the last 16 of the Betfred Cup courtesy of a 2-0 win over Alloa Athletic. On the ground where County’s League Cup defence ended two years ago, Callum Morris deflected in Josh Mullin’s shot to give the visitors the lead and Harry Paton added a second in stoppage-time. The result dropped Alloa into second and their tally of eight points will not be enough to take them through as one of the four best runners-up, with four of the second-placed teams already finishing on nine points. Stuart Kettlewell and Steven Ferguson made four changes from the 4-1 defeat to Arbroath in midweek, with the suspended Tony Dingwall joined on the sidelines by Stelios Demetriou, Dylan Dykes and Ryan Dow. Marcus Fraser, Jamie Lindsay, Josh Mullin and Declan McManus all started. Referee Greg Aitken, who was due to take the game, left the game urgently prior to kick-off due to a family emergency, meaning there was a frantic hunt for a late replacement. Just 15 minutes before kick-off, a grade four official was located to stand in as one of the assistants as Ryan Lee stepped up to take charge of the game. Kick-off was delayed by 15 minutes to allow the replacement assistant, local grade-four referee Stewart Johnstone, to arrive. Billy Mckay, County’s goalscorer on Wednesday,linked well with Declan McManus with just five minutes on the clock to come close. McManus collected possession 30 yards from goal while Mckay peeled off and ran in behind, with the ball fed to him and being able to round the goalkeeper, Andrew Graham back-tracked to clear off the line. 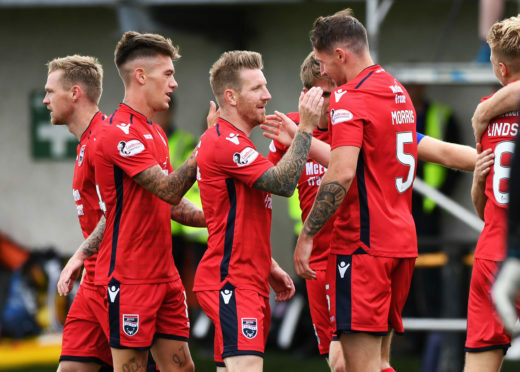 The Staggies were starting to turn the screw as they chased top spot, with Neil Parry repelling Michael Gardyne and then County’s record-goalscorer taking a shot on the bounce first-time that whistled just past the far post. McManus flashed a wild shot across goal and a Josh Mullin free-kick evaded everyone in the penalty area as County, dominating the game, were throwing everything at Alloa. Mckay presented another chance to McManus on 33 minutes and even though the connection was not clean, it still required a great stop by Parry. Alan Trouten had the Wasps’ first clear chance on 49 minutes with an attempt from the edge of the box that drifted away from goal, before County’s pressure finally told. A corner was cleared to Lindsay, who had an age to aim for goal and drew a good stop out of Parry but the ball broke straight to Mullin. The ex-Livingston winger smashed the ball towards goal and it deflected off defender Morris on the way in. The away side had now leapfrogged Alloa into top spot but were not content to sit on their lead, with Parry this time beating away a drive from McManus. It appeared destined not to be McManus’ day as again Parry denied him, this time when Mckay rolled him through and the Alloa stopper was out swiftly with his legs. One goal in Alloa’s favour would have changed the complexion of the group and it very nearly came, with Greig Spence’s acrobatic effort from Kevin Cawley’s cross leaving Scott Fox rooted but the ball trickling agonisingly wide. Paton scored the second in added-on time, smashing in after Mckay’s shot was saved by Parry.